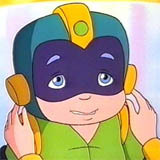 Megaman, voiced by Doug Parker, was created by Dr. Right. He is extremely strong due to his mighty arm cannon but very short and has an unfortunate speech impediment of putting 'mega-' before every few words.